We specialise in content auditing, architecture and migration strategies for major new website launches to protect against critical performance losses, whilst growing brand reach, traffic, engagement, lead generation and ecommerce revenue. ThoughtShift is a multi-award winning data-driven content strategy agency. We’ve consulted with global brands including The Body Shop, Walgreens Boots Alliance and WOLF to audit, plan and launch content on to new platforms and into new markets. Our content strategy consultants work alongside your marketing and web development teams to provide end-to-end advice throughout all stages of your new website launch. Whether your website is built in Magento, WordPress or a custom content management system (CMS), our content strategy consultants start by understanding your unique challenges and goals. We then advise and guide you through your entire website design, content creation and migration process through to successful launch. As content, SEO and website migration experts, our agency has successfully migrated over 100 websites of all sizes. From local businesses relying on their website for new sales enquiries, to global brands processing millions of pounds of ecommerce transactions. Our extensive content audit has been honed to slot in seamlessly with in-house web development teams and external web design agencies alike, covering all forms of text, video and visual content assets (images, PDFs and infographics). Our advanced keyword insight techniques enable us to identify the keywords that are currently sending your website leads and sales. Through Keyword Ranking Tools, Google Analytics and Google Search Console analysis, our content and SEO migration consultants are able to find which pages of your website are driving the most traffic and sales. Our evidence-based approach means that we can provide a definitive list of which pages of content require protecting in the new web design and also what content can be changed without resulting in a loss of traffic and new business. Our proprietary data analysis techniques find gaps in your current content to incorporate into your new site build. We will assess thousands of keywords from “head” keywords with 1-2 words which are more likely to drive traffic, to “longtail” keywords with 4-6+ keywords which are more likely to drive conversions. We will either include the newly identified keywords within existing page body content and metadata or make recommendations for where to add new pages or other content assets into the navigation and URL structure. A critical element in a successful content and SEO migration for a new website is making sure any deleted or moved pages are permanently redirected to their new location on a page by page basis. Temporary redirects do not pass any domain authority across and so you will see your traffic drop otherwise. We include extensive checks of your redirects as standard. When there are hundreds of thousands of URLs at stake, missing one important redirect carrying a significant amount of Google authority can be catastrophic to your traffic and business. Along with your current domain authority, your current metadata is major factor that impacts your organic Google search engine rankings and subsequent SEO traffic, leads and sales. 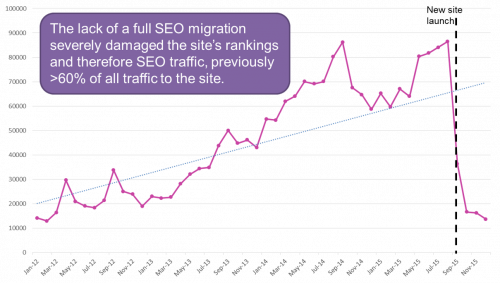 Since 2011, we’ve recovered rankings, traffic and ecommerce revenue previously lost because the website metadata was not migrated as part of the new website launch. Missing out the meta can be just as catastrophic as not redirecting URLs, so we assess and migrate title tags and meta descriptions on a page by page basis. We make sure we migrate every valuable piece of your old site content to your new website and maximise any new opportunities for improvement at the same time. We live test all content, metadata and best practice technical SEO requirements are working correctly once live.